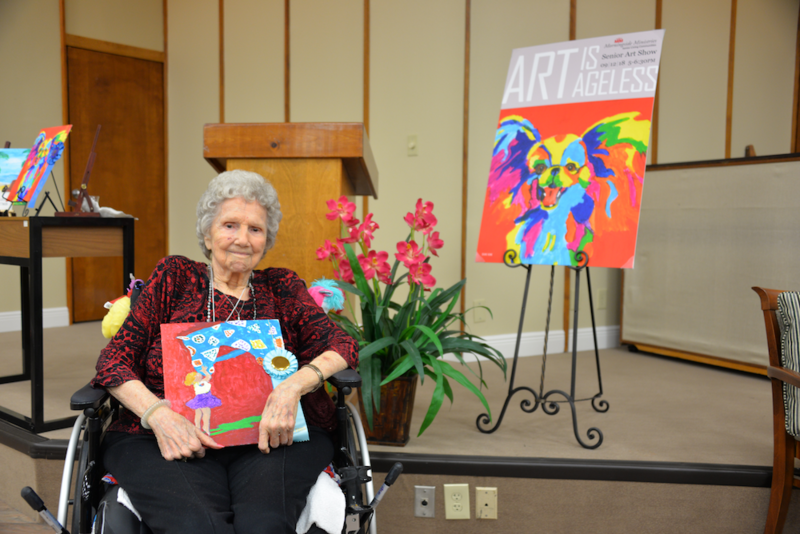 Resident artworks were on display during the second-annual "Art is Ageless" Resident Art Show. Art created by Morningside residents who have passed away were also on display during the show. Resident Ora Lee M. with her prize-winning artwork. Art instructor Pam Henry (right) leads weekly workshops with residents of The Manor. Seventy eye-catching paintings created by residents of Morningside Ministries were on display during the “Art is Ageless” Resident Art Show on Wednesday, September 12. Now in its second year, the event celebrates resident artists and the artworks they have created under the ARTS San Antonio’s ARTSTEACH program. The ARTSTEACH program provides a broad range of participatory arts activities to populations with limited access to artistic resources. Last year, ARTS San Antonio delivered 444 ARTSTEACH workshops to 5,208 students and older adults in the San Antonio area. Since its introduction at Morningside in 2016, the ARTSTEACH program has played an important role for residents such as retired school counselor, Diane Kane. Studies have shown that participatory arts can help older adults with disabilities improve their physical well-being in cardiovascular health, joint mobility, breathing control and cognitive functioning. Even without studies, those who work with older adults have known for years that art offers a wide range of benefits affecting cognitive abilities and overall wellbeing. “The program brightens up the residents’ day,” said arts instructor Pam Henry, who leads weekly art workshops at Morningside. “The classes are held as a social occasion. The environment is relaxed, and that really does help them get more work done.